Sometimes interesting modern conversion rate optimization lessons can be learned from old folktales, such as the Story of Wilhelm, Henriette and the Black Fleece. 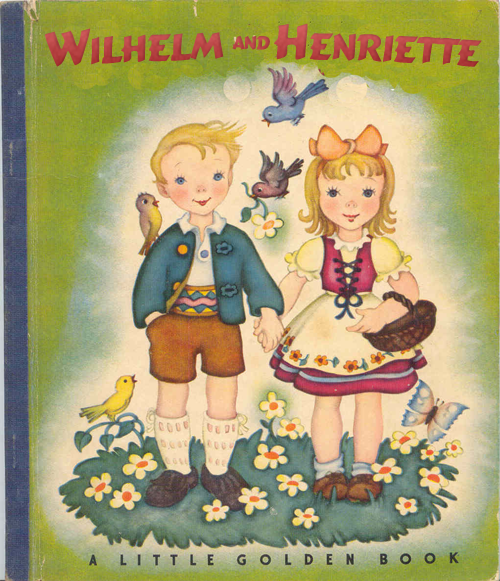 There once were two children, a boy named Wilhelm and his sister Henriette. They lived with their father tending sheep in a pasture far from town. Sheering day came, and the two children helped their father sheer the dirty white fleece from their flock, but in the process their father cut his hand. He wrapped it in a bandage, and told the children to ready the fleece on the cart for him to take to town the following day, and he retired to their small hut. The next morning their father woke with a tremendous fever. Wilhelm and Henriette were afraid they would lose their father as they had their mother some time ago when they were little. Their father asked his children to take the sheered woolen fleece into town to sell for money. He also gave them four pieces of jewelry that were once their mothers: an ivory comb, a necklace, a brooch, and a ring. Their father said “Use this jewelry to purchase medicine for me, otherwise I may die.” And his children promised to do as he asked, and they left immediately. “Perhaps we may trade you our cart for yours?” asked Wilhelm. And with that, Wilhelm handed the merchant the ivory comb, and the merchant helped the children switch horses from one cart to the other, for both carts were rickety enough to be exchanged in the trade, and the children continued into town, faster now than the merchant hauling a much larger cart of dirty white fleece, rather than their beautiful striking ebony fleece. “That comb was to purchase medicine Wilhelm.” scolded Henriette. “Indeed it was Henriette, however we shall make even more money with this fine black fleece to more than make up for the loss of the comb, and return to father with not only the medicine, but more money besides.” Henriette nodded in agreement. 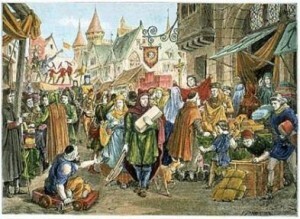 And with that, Wilhelm handed the man the brooch, and the man led them into the center of the market square and provided them a stall where a large crowd of merchants milled about going from stand to stand looking at and purchasing goods. And with that, Henriette handed the clown the necklace, and the clown smiling began prancing off singing of the virtues of the fleece and wool of Wilhelm and Henriette. And with that, Wilhelm and Henriette looked at each other in the eye, and agreed to hand their mother’s wedding ring over to the kindly woman, who then walked off, only to return shortly thereafter with numerous posters which she hung up around the town, on walls, on posts, and the like. Time passed and even more came to the stall, massive crowds had begun to form, seeking information about the fleece they had seen in the center of the town square, heard about from the songs of the clown, and seen posters of from the beautiful woman. Yet none bought the fleece. The children now distraught, packed their cart with their black fleece, and rode out of town, heading back to their house. Though now they had no money, no jewelry, and no medicine. Upon reaching their father, his fever had progressed, and he never woke again, dying scant days later leaving Wilhelm and Henriette as orphans. While investing in Search Engine Optimization, Paid Ads, and Social Media, Wilhelm and Henriette followed their gut about their product. They thought one product was better over another, and rather than test what the market preferred, went with their own impulses, only to find that the market itself not only didn’t view their product the same way they did, but in fact looked at the product differently. Too often marketing managers are forced to wear way too many hats. They’re the SEO expert, the person who places the paid ads, the person expected to manage the social media, the person who is in charge of the content marketing on the website itself, the blogging, etc. All this on top of the jobs they did BEFORE the internet gave them even more work. So it’s easy to understand being distraught, and unable to wear every hat expected. Far too often though the hat that gets abandoned first is testing. A/B testing. Usability testing. Conversion testing. Product testing. It’s easy to focus on traffic or engagement on Facebook. To have a higher ad click through rate. And all those are good things. In the story it took the children from sitting on the exterior areas of the market trying to get anyone to buy their fleece, to being in the center of town with everyone coming and seeking them out to view their fleece. But their critical mistake was following their gut. They followed their gut about the product, and how it was perceived. Now granted, it’s hard to do a usability test on a dirt market road in medieval germany, but transplanting this to modern day, it’s much easier to do usability tests on your ideas. Whether it’s new products, combinations, how you present the products, etc. You can do small or large user tests, you can see how other people actually respond to it. Imagine if Wilhelm and Henriette had been able to do a small 5 person marketing test of their black wool, and had 5 merchants tell them they’d never purchase that wool because of the poor quality, and how for them the color is nice, but the diameter and length of the wool was far more important. Or maybe the stall was too small, with a narrow entrance and while they brought in plenty of merchants, too many were turned away without seeing the fleece because the stall was in a good location, but poorly designed. You should be always optimizing your SEO, and your PPC/CPC ads, as well as active in Social Media, as well as any other ways you can generate traffic. Without traffic you’re sitting alone at the edge of the market. But once in the center of the market, your work isn’t done, and your “gut” just isn’t good enough. You have to test not only your products with your users, but also how you present your products. Do user testing on your website. Do A/B testing on your top landing pages with different ways to approach a transaction or goal. Don’t just sit back and wonder why if your traffic is going up, why your conversions are going down. Don’t just wonder why your average transaction value is falling. Don’t just wonder why so many people leave your conversion funnel halfway through. Test it, or your father will die leaving you an orphan in a dark pseudo-germanic faux folk tale.